Media reports from the Lebanese capital Beirut say that at least 23 people have been killed and many injured in twin blasts near the Iranian embassy. Unconfirmed reports indicated that at least two Iranian civilians were among the fatalities. Initial reports say that over 150 people have been injured, including embassy guards. Al Manar TV, the official channel of the Hezbollah militia group, broadcast images of destroyed vehicles and raging fires outside the embassy. 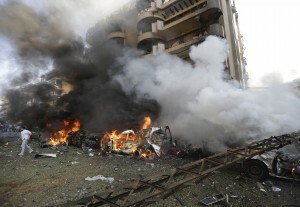 The Associated Press reported that the gate of the embassy had been blown out. Lebanese channel NBN showed footage of considerable damage to the embassy building. A security official quoted by the Al Manar TV news channel said that a suicide bomber on a motorbike and an explosive-laden car had been used in the attack, but other reports disputed the use of a secondary vehicle. At press time, Lebanese television networks reported that the Iranian Cultural attaché may have been killed in the blasts.